I was recently invited to come along to the Playstation Playfest and asked to bring my family along to try out some of Playstations new games. Now, although I adore computers and spend a frighteningly large amount of my time with them, I was never really a serious gamer. However, my two sons aged 11 and 9 definitely count as serious gamers so with their help I felt I’d have a good opportunity to check out Playstation’s latest offerings and see how well they worked for families. The event itself, held at Sony’s headquarters in London, was extremely well organised and very well designed, with exciting interactive areas (you could try out Dance Star or record your own game voiceover, for example), comfy bean bags, a real chance to get hands on with the games and plenty of snacks and coffee for kids and grown ups. Playstation’s staff were on hand to give us help and advice although frankly all I had to do was unleash the kids and they were happily occupied for the next two hours. My eldest son made a beeline for Ratchet and Clank: Into the Nexus which he said was an excellent game and very exciting. He was immersed in that for at least twenty minutes and I had to drag him away. We then went to try out Wonderbook: Walking with Dinosaurs which was one of my favourites. It takes full advantage of 3D technology so that the ‘book’, which you interact with using a pointer, can display all kinds of exciting 3D scenes on the screen. My kids were able to answer an interactive dinosaur quiz and then view a fight between two dinosaurs, check out a dinosaurs bones and help rescue a baby dinosaur that was stuck in a mud slide. The children playing also appear on the screen in many scenes so they really feel they are part of the adventure. This is a lot more educational than many games I’ve seen and has the potential to really involve and interest kids. My only worry would be whether it would stand up to being played over and over again: I suppose this would depend on the amount of content and storylines they manage to shoehorn into the game. We also enjoyed Wonderbook: Book of Spells which helps you to make magic spells and potions. The Wonderbook games took real advantage of the ‘wow’ factor of modern technology and all the children I saw playing them seemed thoroughly engrossed. We tried out recording our own voice overs for adverts and a scene from the Invizimals. Typically again my kids were not as excited by this as I was – they’ve all grown up with Garageband and don’t see why it is amazing being able to edit a sound track in ten minutes. When I trained at BBC Radio we were still taught how to edit tapes using a scalpel and sticky tape, so for me it’s still astonishing that you can have SADiE in your living room. But I digress. My younger son tried out a game called ‘Tearaway’ for the Playstation Vita (their handheld console) which he says was ‘epic’. 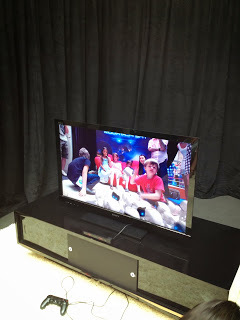 Finally we all went to look at the PS4 which had its own room. The children settled down on a giant, hand shaped sofa in front of the screen. The screen showed the children, the sofa and the room. Using a controller, the kids could then make various items such as lots of little robots and a floating droid appear on the screen in the virtual room and interact with them. I found the whole experience slightly baffling but I can see that it could work very well in some games. Here’s a video which will probably give you a clearer picture of the PS4 Playroom. All in all this was a very enjoyable day and showed me that a lot of the PS4 games can be played in family groups (rather than by Junior on his or her own parked in front of a PC) and can even incorporate some educational material. It’s pretty amazing to be able to construct a 3D dinosaur out of bones and watch it come to life and walk off the page, as happened in Wonderbook: Walking with Dinosaurs. I still wish I’d got my boys to come with me to play Dance Star, but apart from that they tried out nearly everything in the room and the Wonderbook was their top favourite and mine. How green is Sony? I didn’t ask specific questions about energy efficiency for the consoles on show at this event but generally Sony ranks 8th in Greenpeace’s Guide to Greener Electronics and Greenpeace note that their energy efficiency is generally good. This is a respectable score although not outstanding. One environmental plus is that the Playstation 4 will definitely accept used games: as should all consoles, surely?